Immigrant advocates are notifying hundreds of families eligible for new asylum interviews as part of a deal agreed to by the Trump administration. 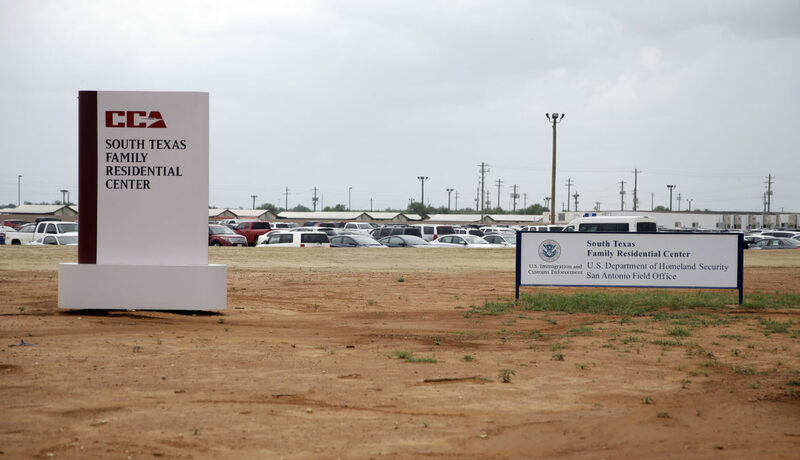 So far, attorneys have identified 60 eligible parents and children still locked in a family detention center in Dilley, Texas, pictured here. Attorneys say there are likely more class members detained at the Karnes County Residential Center in South Texas. Families separated by border officials earlier this year won a second chance to ask for asylum under an agreement reached in federal court last month, and a Justice Department lawyer said those interviews would get underway soon. But lawyers for the families say the government has backed off that pledge and now plans to delay those asylum screenings until at least mid-November. The families covered by the settlement include parents who failed their initial asylum screenings while they were separated from their children earlier this year and forced to make their case in the midst of extreme trauma. As part of an agreement to close legal challenges from these families, the government agreed to grant them new interviews now that they’ve been reunited. Now it wants them to wait. For some, that means spending another month in detention. Many of the families are free on bond, but at least 60 of the parents and children remain in detention after months. If they want a second chance at asylum, they’ll have to spend more weeks locked up, waiting for the government to act on a deal it agreed to in September. When lawyers on both sides first presented the settlement, U.S. District Judge Dana Sabraw asked whether they’d be willing to act on the agreement right away. Justice Department attorney Scott Stewart said yes. The settlement won’t be final until Sabraw signs off at a hearing set for Nov. 15 in San Diego. But he told the lawyers not to wait until then to start the new asylum interviews. “We ought to start that right away,” Sabraw said. But the families’ lawyers recently told the court the Justice Department had reneged. According to an emergency motion filed Wednesday, Stewart wrote in an email “that the government will not move forward with implementing the settlement” until the deal is finished. In other words, the Trump administration has decided to delay the new screenings for at least another month until the deal is finalized. “Normally when a lawyer makes a representation in open court to a judge, you can rely on it,” Bernick said. In exchange for the new asylum interviews and some other concessions from the government, families covered by the settlement would not be able to file any further claims against the government over its family separation policy earlier this year. According to Bernick, who read a portion of the email over the phone, Stewart was concerned that families would get their new asylum interviews before the government could be sure it wouldn’t face any more suits. The Trump administration announced an end to its widespread family separation policy in June, and is now considering forcing families to choose between waiting out their immigration cases in detention together, or allowing the government to hold their children in a shelter before placing them with another relative. The Justice Department has not responded to a request for comment. Sabraw has given the government until Monday to respond to the motion. Immigrant advocates and legal groups are already notifying hundreds of families who are eligible for the new interviews, collecting their signatures on settlement notices. So far, they’ve identified 60 eligible parents and children who are still locked in a family detention center in Dilley, Texas. Bernick said there are likely more class members detained at the Karnes County Residential Center in South Texas. Already, according to the Wednesday court filing, dozens of families in detention have agreed to return to their home countries rather than remain locked up any longer. “I think that the government detains people in this way as a way to prevent them from their exercising their rights, as a global matter,” Shebaya said. If the government starts acting on the settlement Nov. 15, detained families could be forced to wait weeks longer for a new meeting with an asylum officer. “The process does take some time, so our expectation would have been that the government is immediately moving to put this into place,” she said.